In July 2016, Michelin shocked the culinary world when they awarded two coveted Michelin stars to Singapore hawker vendors. This was the first time in Michelin history that Asian street stalls were awarded the coveted star. Hawker centers are at the core of the Singapore food culture. As we mentioned in our article The Best 6 Hawker Centers to Eat Singapore, the food centers are where Singaporeans connect over everyday meals. On our quest for authentic food in Southeast Asia, we made it a point to find out what made these hawker stalls so special. 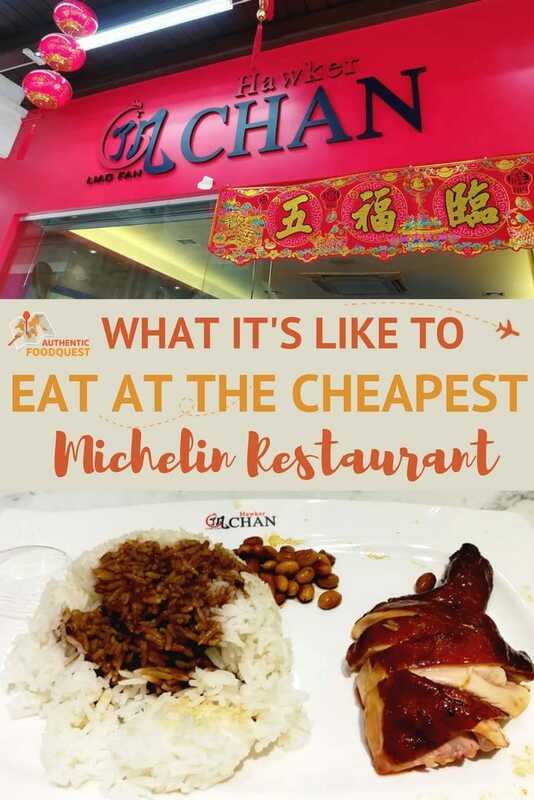 Join us on a journey to discover what it’s like to eat the world’s cheapest Michelin starred meal in Singapore. But, who are the two very special hawker stalls that got the precious Michelin Star awards? 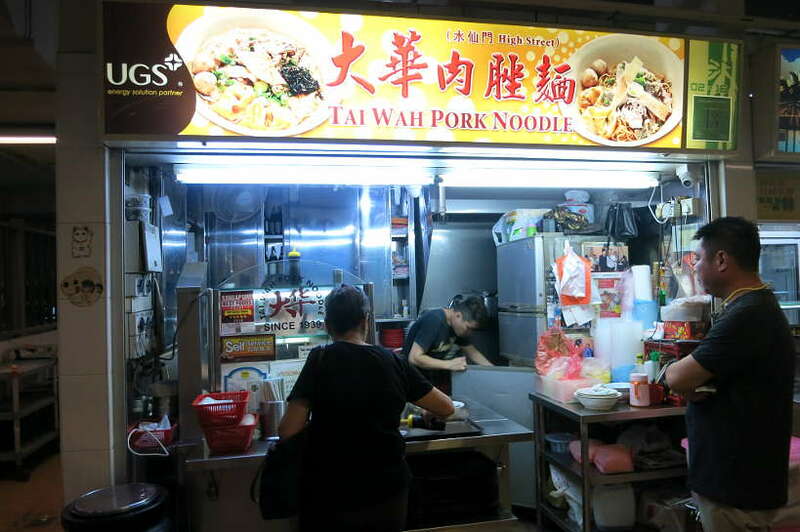 First, you have Tai Hwa Pork Noodles hawker stall. The specialty here is the Singaporean dish Bak Chor Mee or minced meat pork noodles. This hawker stall is still operating at the same location in Crawford Lanes amongst other food stalls at one of Singapore’s many food courts. The second Michelin Star restaurant is located in the Chinatown Food Complex. Since winning the Michelin Star, the chef and owner Chan Hon Meng opened a new restaurant in the core of Chinatown. This restaurant, called Liao Fan Hawker Chan, was opened to meet the growing demand. 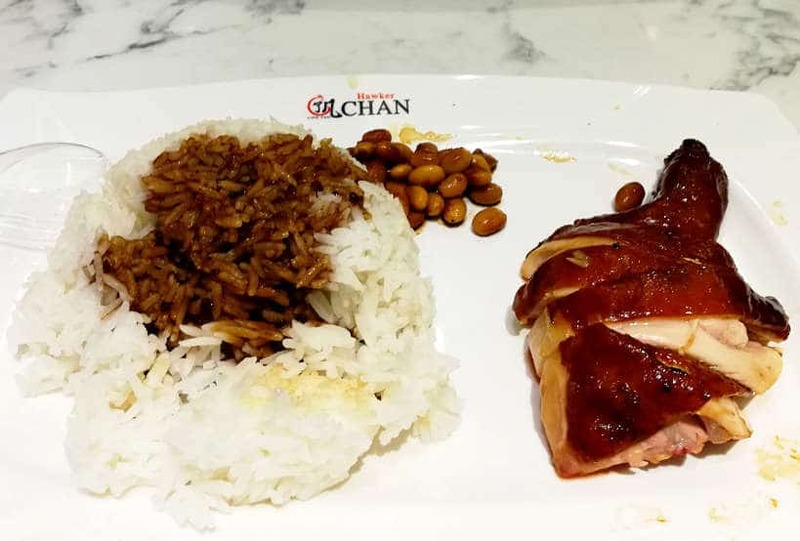 The restaurant serves the same menu including the award winning Cantonese-style soya sauce chicken rice and a few new items. A few days prior, we went to the Hong Lim Food Center in Chinatown to try Bak Chor Mee at a food stall run by a family member of the Michelin Starred hawker stall. The service was fast and the portions generous, but we were not fans of the flavors. With that experience, we decided to skip the Michelin Starred Tai Hwa Pork Noodle hawker stall which served the same food. Instead, we focused on Hawker Chan and the signature soya sauce chicken rice. The long awaited day came! We set off to Hawker Chan eager to taste our first Michelin Starred meal from a hawker center. Prior to this, we had eaten at Michelin starred restaurants before in Chicago, Los Angeles and France. These were the typical formal Michelin experiences you might expect with luxurious decor, outstanding service and hefty checks. 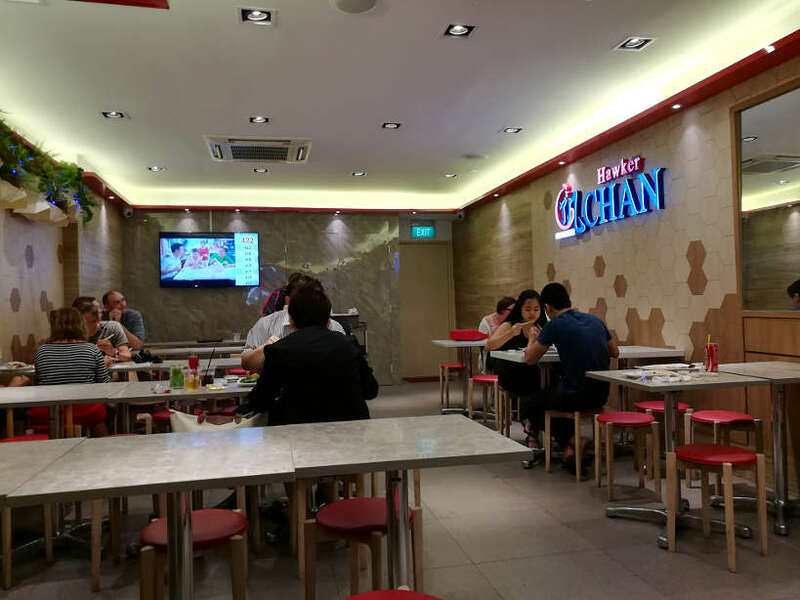 We went to the new restaurant, a standalone casual dine-in not far from the original food stall at the Chinatown Food Complex. All the reviews we had read talked about long lines and wait times. We went fully prepared to wait for as long as it would take to taste the award winning Soya Sauce Chicken Rice dish. Hawker Chan waiting area empty for us that afternoon! When we got there, we were pleasantly surprised not to have to wait. We walked directly into the restaurant and straight up to the counter to order our meal. 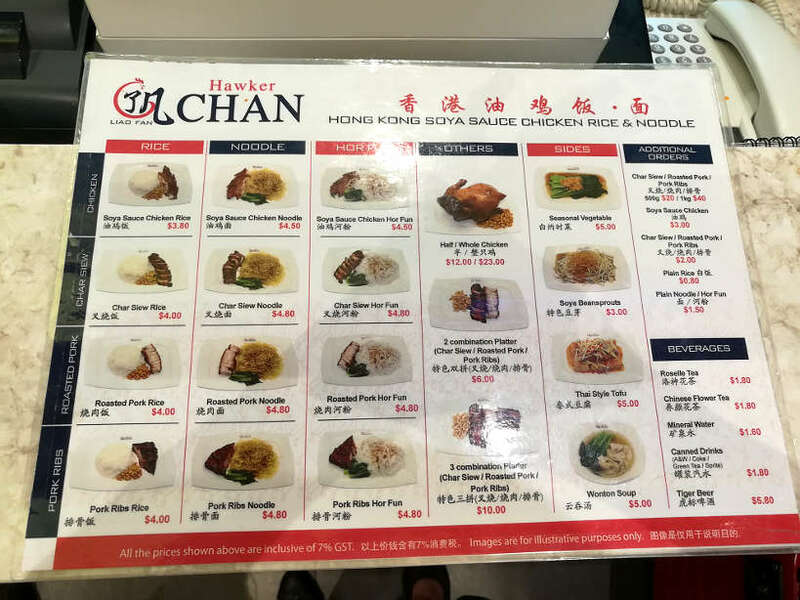 Staring back at us in the spotless restaurant was a huge lit menu with food and drink choices including the legendary Cantonese-style Soya Sauce Chicken Rice. After placing our order, we took our seats on the ground level of the two story restaurant. Sitting in the welcomed air-conditioning we waited patiently for our meals. Adorning the walls were Michelin reviews of Hawker Chan published in different international press journals. While casual and comfortable, the place felt devoid of the warmth typically found at a Singapore hawker center. However, in keeping with Michelin’s standards, the restaurant was impeccable with tasteful design and decor. Given it is the first time a hawker stall has ever received a Michelin Star, there are no set expectations. After waiting for only about 15 minutes, our order was ready and we picked it up at the counter. Eager and salivating, we could not wait to try this Michelin star chicken rice dish. At this point, we had already eaten chicken rice before at several hawker centers. Needless to say our expectations were high. We were itching to taste what makes this particular chicken rice dish worthy of a Michelin Star. At first sight, this seemingly simple dish won us over. The chicken glistened and the steaming white rice topped with the famous soya sauce sat next to each other as the perfect pair. To complete the union, a side of soya beans was served. A dipping sauce of freshly minced red chili and garlic was also provided. The chicken, moist and juicy, fell apart as soon as we poked our forks into it. The succulent chicken and rice hit us with an explosion of tastes and textures. The soya sauce, drenched over the rice, had sweet and salty flavors While the chicken skin was crispy, a nice contrast to the smooth texture of the meat. The meal was excellent and very flavorful. The chicken was tender and perfectly cooked while the rice and sauce paired extremely well together. This was a genuinely good meal, and an experience to be had. Upon reflection, we couldn’t shake off the feeling that we expected a little bit more. When the two hawkers got their Michelin stars, both chefs said they would not raise prices. In interviews following, both chefs said while they would maintain their prices but expected the queues at their stalls to get longer, from about 30 – 45 minutes to 2 -3 hours for a plate. 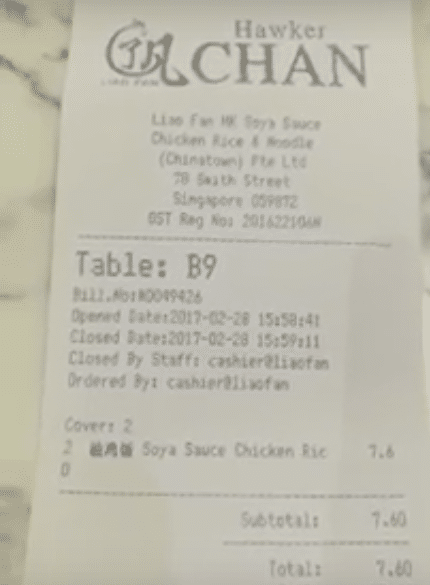 Prior to the Michelin star, Hawker Chan’s chicken rice was priced at SG 2.00 (approx. $1.50 USD). At the restaurant we paid SG3.80 per meal for a total of SG7.60 (approx. $5.54) for two. While not a huge increase for the comfort of spacious seating and air conditioning, an increase nevertheless, Regardless, it is a still a great deal because there is nowhere else in the world you can get a one star Michelin meal for under $5.00. PRO TIP: If you want to skip the lines and avoid long waits, go during the off-hours. We went in the middle of the afternoon, at about 4pm and had no problem finding a table. This way you’ll be able to enjoy your meal and the entire Michelin star experience without the wait or the crowds. 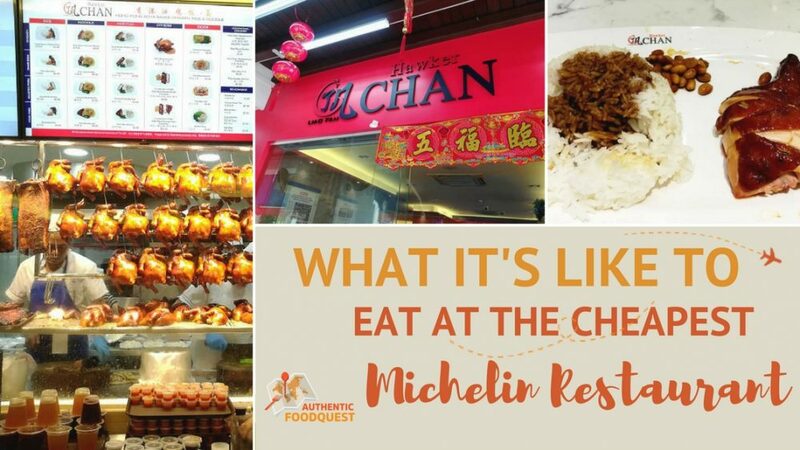 When Michelin released its guide awarding One Star to the two now famous Hawker Stalls, it created a mini storm in the Singapore food local scene! Beyond the surprise, it seemed like Singaporeans had mixed feelings about this recognition. We spoke with many local Singaporeans, from teachers to business owners and even Uber drivers and everyone had an opinion. However, some locals Singaporeans thought the stalls were overrated. For them, the Michelin awarded vendors are not the best hawker vendors in all of Singapore. They all easily rattled names of other hawker stalls they thought had better versions of the same dish. In the end, the Michelin awards did not change their opinion of their favorite hawker centers and vendors. The will continue to seek out the best food and wait in line as long as necessary to get their favorite dishes. After being awarded a Michelin star in July 2016, Hawker Chan opened his new restaurant a few months later in November. Tai Hwa Pork Noodles stayed at their current location in Crawford Lane. Both vendors continue to serve their loyal customers and they now see an influx of tourist and newly acquired fans. 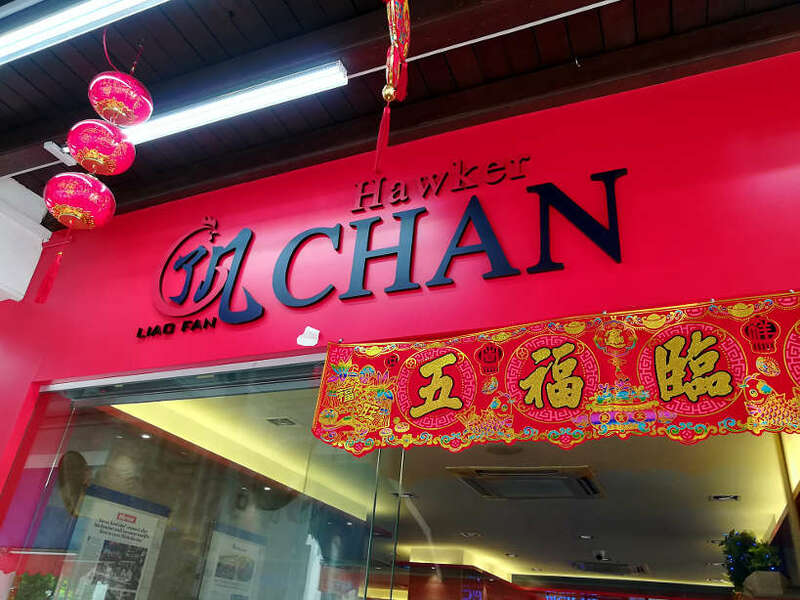 Today, Hawker Chan has five branches: three in Singapore, one in Taiwan and another in Thailand. The Philippines and Indonesia are due to open new Hawker Chan eateries in the next two months. What a transformation! Beyond this success, how does that influence the other 5798 hawker stalls and the future ones? From street hawking since the 1800’s to today’s hawkers, hawker stalls continue to be an important part of Singaporean history and tradition. The future of hawker vendors and stalls is evolving. On one hand, young Singaporeans are looking for better-paying opportunities and working conditions. On the other hand, many hawkers owners are about to retire. To fill this gap, there is there is a new generation of Singaporean hawkers called “hawkerpreneurs” that is emerging. These young hawker vendors are leaving careers and choosing to become hawkers vendors. Many are following their passion and are committed to preserving the local food culture. For them, the Michelin award is really a message of hope that they can make it big! Hawker centers in Singapore are at the core of the culinary culture and the Singaporean cuisine. The Michelin star award and the international recognition is a tribute to a rich culinary culture. Whether you’ve eaten at Michelin restaurant or not, a trip to Hawker Chan in Singapore is worth the experience. Leave all your expectations behind about Michelin restaurants and ease into the hawker stall version. However, do keep in mind that Singapore has a diversity of unique flavors and dishes. Don’t forget all the other hawker centers that are just as famous with many more local and authentic dishes. Address: 466 Crawford Ln, #01-12, Singapore. Prices: $SGD 6, $8 or $10 for small, medium, large bowls (Approx. $4.37/5.83/7.29 USD). Address: 78 Smith St, Singapore. Hours: Monday to Sunday from 10am to 8pm except on Wednesdays. Prices: $SGD 3.80 (Approx. $2.77 USD). Have you eaten at a Michelin Starred Restaurant before? What was your experience like? Share your comments below. And whoever said good food has to be expensive? I’m happy a good quality hawker stand was awarded this coveted star, since they obviously have really good food. That chicken rice looks mouth-watering! You are completely right….good food does not need to be expensive! The food is incredible, and worth a trip. Thanks Tami! Love trying street food where ever we travel and have heard about the hawkers in Singapore and the Michelin star so this was an interesting read. I can’t imagine the star awarding team tried out every hawker in the city, did you find there’s a lot of jealousy among hawkers as a result of this? It truly was a fascinating experience of enjoying the world’s cheapest Michelin Starred meal. Indeed, it must have been an interesting experience for the Michelin reviewers. In terms of jealousy, we didn’t really pick that up, instead, it was an overwhelming amount of pride for hawker centers and vendors in general. Cheers! Claire and Rosemary, you 👏🏻 two 👏🏻 are 👏🏻 awesome. Not only is this topic A+, but you made me want that soya chicken rice dish so bad. Keep exploring awesome foods! Have you ever found any weird dishes including tea? Or weird/cool tea drinks? Thanks so much Mel 🙂 And so glad you enjoyed this article. We appreciate it! Yes, the soja chicken rice is quite amazing and worth trying if your travels take you to Singapore. We did discover some unique drinks that we’ll be writing about shortly!! Thanks so much! 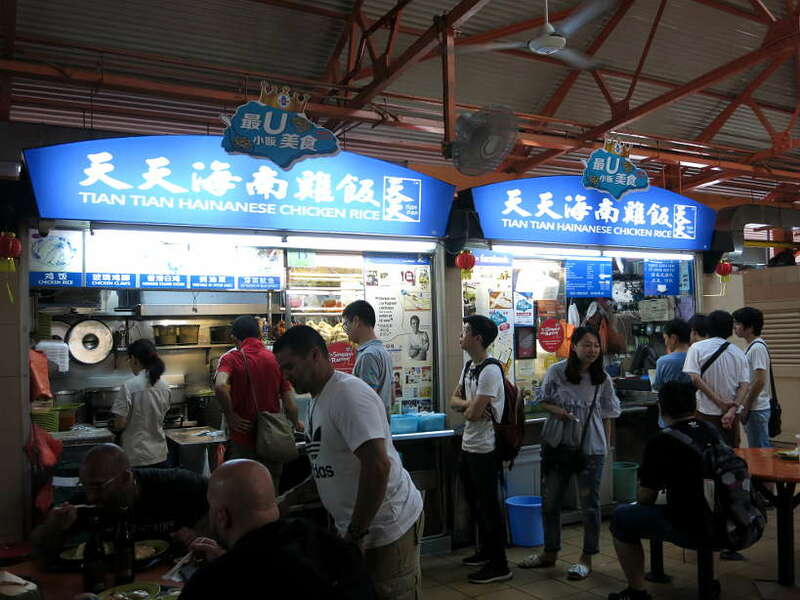 I love the Hawker Centres, I haven’t been to these two yet but already noted them. I do think that the Michelin-awards sometimes create mixed feelings among the locals. But I think it’s great that the stars are also awarded to restaurant which are not the typical upscale Western cuisine ones. Agree, the Michelin stars do stir up emotions, though the one thing that is consistent is the celebration of hawker centers. Do indeed check them out the next time you are in Singapore. Appreciate your comments, Liz. Never been to a Michelin restaurant, I was in London a couple of years ago, and there was no reservation available. I am a food lover, always looking for new places to eat, I will save this post! The great thing about Hawker Chan in Singapore is that you don’t need to make reservations as you would with upscale restaurants. Simply go at about 4pmish or wait in line. For the world’s cheapest Michelin starred dish, this one is worth the experience 🙂 Thanks, Esther! I heard about the amazing food in the hawker stalls from a former boyfriend who used to travel to Singapore for work. I always assumed he was exaggerating, but the soya chicken looks really tasty! I’m definitely putting this on my list when I visit Singapore. Your ex-boyfriend was certainly not exaggerating about hakwer centers and the local food scene in Singapore. For sure a must experience for your next trip to the island. Be sure to explore the other hawker centers too, they are all unique with their own character. Let us know what you think after you go to Singapore 🙂 Cheers. I’ve actually been to a 1 star Michelin restaurant in Taiwan – I was blown away at how good the food is at such a low price! I have yet to try these Michelin restaurants in Singapore! As you noted, Hawker station is where it’s at! You are right, the food at Michelin starred restaurants is quite fantastic, unfortunately it comes with a hefty price. 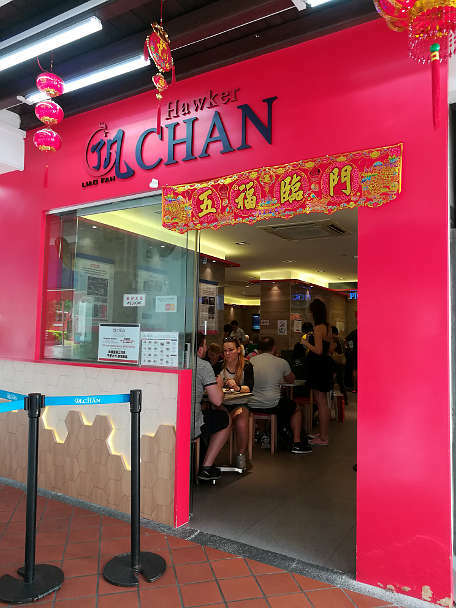 Hawker Chan in Singapore is the best place to go for the world’s cheapest Michelin starred meal. Hopefully, you can visit soon!! I was able to try this and it was indeed incredible! I must say, most of the great foods here in Singapore are commonly found in hawkers centres. Yay, you at at Hawker Chan’s as well. Yes, truly tasty and incredible. Did you have to wait in line? Totally love the different hawker centers in Singapore…it’s where all the action is. Lucky you for having access to the hawker centers, miss the food in Singapore, terribly! Thanks for stopping by. 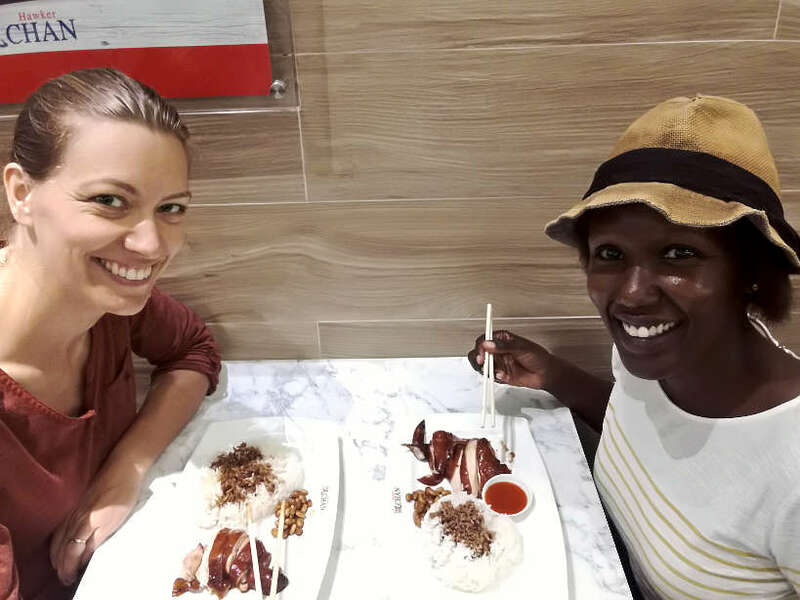 I loved trying all the food in Singapore! These two stalls are going on my to eat list for the next time I’m in town. So do you think the rating made the meal better, or worse? That’s a lot of hype to live up to, but the price really can’t be beat! Hi Melody, thanks for stopping by:) Eating at a Michelin starred restaurant is quite an experience. This one gets much better with the affordable prices. Absolutely worth the experience!! That is wonderful. I would sure love to taste that chicken soya sauce! I love that there are Michelin-starred restaurants that are affordable to eat at! And I’m glad that the food held up to you dreams and expectations. There’s nothing worse than being let down by a plate of seemingly-delicious food! Oh my God, 7.60 SGD is so cheap for two people! I think I must go there when I visit Singapore. I am going to Penang next weekend. Do you have a tips to eat cheap there? That’s great….you will love Penang. We’ll actually be writing about that soon. Two tips for you. Eat Char Kway Toew, one of our favorite stir fried dshes. And secondly, visit the only food museum in the world. It’s a wild and tasteful experience. I’m impressed that not only were they recognized by Michelin, but with stars instead of Bib Gourmand! I wonder if they increased the prices because of increased overhead with the new restaurant? Either way, that chicken looks delicious! I hadn’t heard that Michelin gave out stars to a food stall. It’ll be interesting to see if more are to come. I’ve heard great things about food in Singapore and your meal looks tasty. It’s great that you didn’t have to wait in line. I would have a hard time waiting in a line for 45-min at a food stall. We are just as curious as well to see if any other hawker centers that will win awards this year. Regardless, recognizing this important and unique element of the Singapore food is amazing! We did wait 45 minutes one time for a dish, and it was so worth it. You’d be surprised at the diversity and quality of the cuisine. Worth the visit, Lara!! Food is the biggest reason I want to visit Singapore. I’m wondering if Michelin will start awarding stars to other casual restaurants. 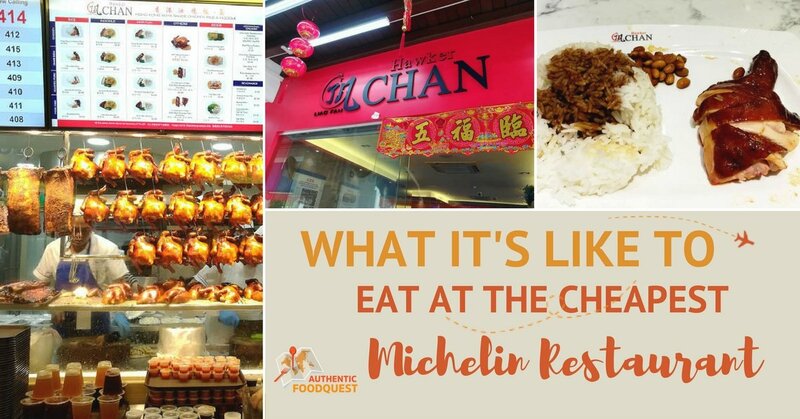 Michelin did create waves in the culinary world when they awarded the Michelin stars to hawker center vendors. Indeed the food in Singapore is amazing and totally worth the experience. Thanks Shruti, for stopping by. Looks fabulous! I love when we are able to find a smaller restaurant that has amazing food (and almost always a better price). Did you go at a non peak hour (hence no waiting) or was it just lucky timing? That chicken and rice dish looked so yummy! What a cool experience, and two dinners for $5, awesome!! You are right Miranda, there is no where else in the world, where you can have a delicious Michelin dish for less than $5.00USD. A neat and delicious experience!! Singapore is on my list so this will happen sometime in the future! What a crazy great price for awesome food! I love that you approached this with such specificity and clarity! It’s amazing that the Hawker Stands won such notoriety! Wonderful too that they continue providing affordable and delicious (if underwhelming food.) I’ve never veered to visit a Michelin restaurant but sense I’m missing out. Thank you so much, Elaine, for your wonderful feedback. The hawker center experience in Singapore is unlike any other local food experience. The food is amazing because vendors specialize in just one dish. You can taste the years of love and passion that go into it. If you’ve never been to Michelin restaurant, it is worth the culinary experience. Give it a shot, and better yet in Singapore, where the meal will cost only $5.00 🙂 Cheers! I love this! I had no idea that this happened! It’s the perfect foodquest then. I love that anyone can eat here. And good for Michelin for ranking based on the food, not just the atmosphere! First off, that Soya Chicken Rice Dish looks mouth watering, the kind of meal that’s cooked to perfection and full of flavor. I had no Idea that a casual dining establishment could be considered Michelin Star, what a pleasant surprise. I’d love to try it to see what really sets it apart from the other hakwer vendors. I’ll be sure to seek this out the next time I’m in Singapore, the price is certainly right! Agree completely, good food does not have to be expensive. The food in Singapore is amazing and a trip to Hawker Chan as well to the other centers is well worth the experience. If you have a chance to visit Singapore, we definitively say…go for the food!! Lovely. I had heard of Chan too. It just goes on to show it is not always that Michelin would award stars for those expensive looking restaurants in an expensive address. You are so right, good food at all prices levels deserve recognition from Michelin! Thanks, Nisha. LOL on those prices guys! I am a street stall junkie in Thailand, and to think these guys got a Michelin rating is beyond awesome. Good on Michelin too for realizing amazing food despite its price and stall location. The Thai veggie I eat for 1 USD in Chiang Mai, 3 veggie dishes and rice, served fresh daily, is as tasty and delicious and fantastic as the dish I had at Tao, for $175 USD. Right on and good on Michelin for recognizing amazing food. For us, at the Michelin restaurants we’ve eaten at, have been really good, even exceptional. 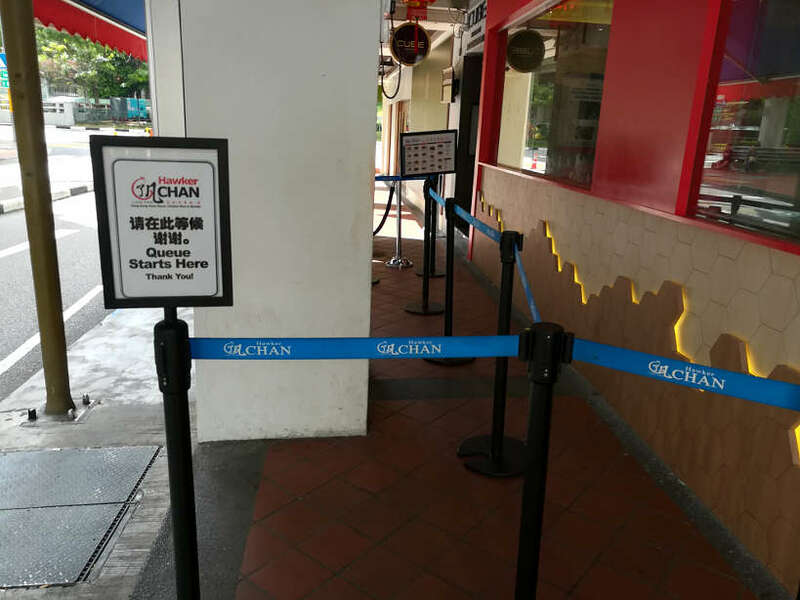 It’s hard to compare that experience with the one at Hawker Chan. What remains consistent though is amazing high-quality food. Be sure to check it out on your trip to Singapore 🙂 Thanks, Ryan. It’s great that Michelin has moved into affordable food! What a huge honour for these two Singaporean establishments. 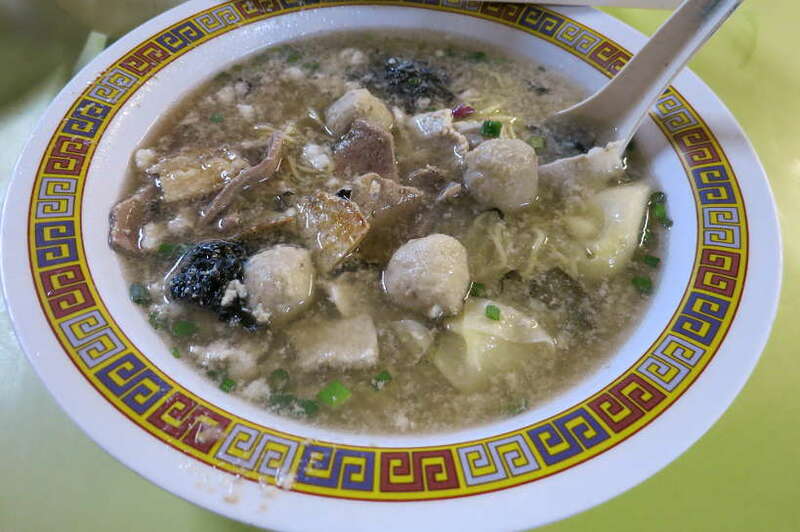 I enjoyed reading about your visit and will hope to check out Hawker Chan on my next visit. I believe Michelin has produced an overview of street food in Hong Kong and Macau and the big news on our streets is the whisper that Michelin is coming to Bangkok. Will watch with interest! Oh really, Michelin coming to Bangkok…please do keep us posted!! So glad you enjoyed the article. The Singaporeans we met are honored by the recognition. Definitively worth checking out the next time you in Singapore. If you can, go at off hours like we did, and avoid the crowds 🙂 Cheers!